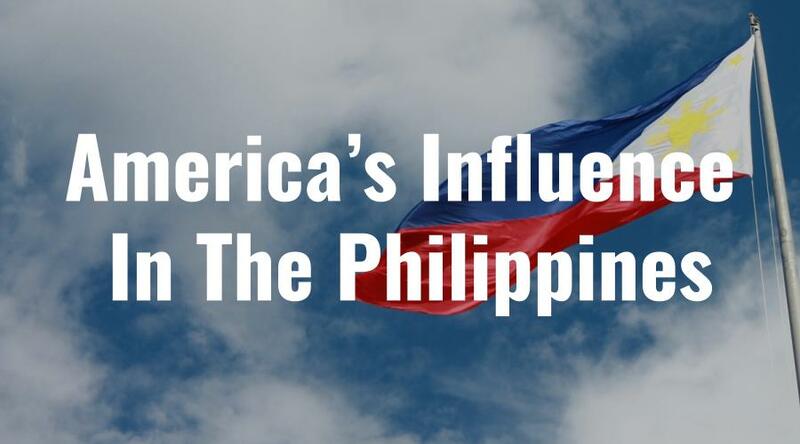 America has had a huge influence on the culture of the Philippines. Here’s a few fun facts as well as a few specific ways in which American culture has influenced Filipino culture. In 1898, the United States declared war on Spain, ultimately resulting in what is called the Treaty of Paris, in which the Spanish agreed to give up the islands of the Philippines in exchange for $20,000,000. The Philippines had been ruled by the Spanish for nearly ____ years. During first years, there were some conflicts between the U.S. and The Philippines. But during World War I, they came together and the Filipinos fought alongside the Americans. After WWI ended, the U.S. continued to rule over the Philippines, and gradually their relationship became much more friendly. In 1934, the Tydings/McDuffie Law was passed, making the Philippines commonwealth of the U.S. The United States agreed to give the Philippines 10 years to prepare for their complete independence. But because of WWII and the Japanese invasion of the Philippines, that promise was not realized until 1946. On July 4, 1946, the United States declared the Philippines an independant nation. Now, the relation between Americans and Filipinos are very friendly and warm. Filipinos love America and Americans. They often decorate their jeepneys with american flags or “God Bless the USA.” They also enjoy American music and clothing, while still retaining their own Filipino way of life. Here are some cool things you may be interested to know were adopted into the Filipino culture from America. When the United States took over the Philippines, the people began to be free to join whatever religion they wanted. (During the Spanish rule, the Catholic church was established as the national religion and was strongly enforced). Because of this new found religious freedom, there began to be many different churches besides Catholicism. Today, it’s remarkable to see just how many different Christian churches there are in the Philippines – this religious diversity has become a big part of the culture. Americans introduced the idea of free education to the Philippine islands. The United States even sent teachers to help establish schools where the Filipino children could have a free education. A large group of these teachers were called “Thomasites,” named after the boat that they came on, called Thomas. Jeepneys, Swing Dance, Democracy, etc. Being LDS is awesome and reading this stuff in school is really neat. – Majority of Filipinos listen to 80% American/English songs and 20% OPM songs. That’s from decade 60’s to date. If it ain’t black and he/she sings and mimic the performances of Frank Sinatra, Patti Austin, Bryan Adams and Beyonce, then probably he is a Filipino. – Less educated or even uneducated Filipino will understand and can speaks basic English. Most are just shy when they avoid speaking English. Behind her are Filipino grammar nazis. – Code-switching the local language with English whenever it’s convenient is very common. Taglish in Manila, Bislish in Cebu. English word is used when it has none, awkward or somewhat very medieval local equivalent. – Filipinos who were born beyond decade 70s mostly have English first name, retaining the Spanish last name by law. – If you want to experience pure Asia, choose not the Philippines. If you like a unique Asia, and witness the embedding of Spanish and American culture in Asian culture, then welcome to the Philippines. Mabuhay!!! – I am commenting as a Filipino who have been to eastern Asian countries. I am from Scandinavia and have been married to a Philippine lady for 6 years, been to Davao twice plus some of the tourist centers, Cebu, Palawan Eden park etc. We plan to move to Davao City from the Cook Islands where we live and work, I love the Philippine attitude to life nothing is impossible everything they do is always done with a smile you become part of the family as soon as you step on their soil and receive a great big MABUHAY! Thanks this helped a lot, I was working on a project for school and was really stuck but this helped me out so thank you. Helped my homework fam, nice work and thanks. Great nice work, helped my homework. how did the americas introduced their sports to the philippines? You know right that we the Filipinos lost our national identity thanks to them, by pretending to be our ally against Spaniards we were just a property to them waiting for a new owner. España introdujo el cristianismo en Filipinas, y frenó la expansión del Islam. España fundó el primer colegio en Filipinas en 1590, y la primera universidad en 1611. En 1863 se dictó el primer plan de educación obligatoria y gratuita, antes de que muchos países europeos la introdujeran en sus propios territorios. Pero ya antes, la Ley Moyano de 1857 introdujo la educación obligatoria y gratuita, para niños y niñas, en todos lo municipios de más de quinientos habitantes. Los EUA asesinaron durante su guerra en Filipinas al quince por ciento (15 %) de la población, se conoce como el genocidio filipino. Principalmente mataron a doscientos mil (200.000) profesores que enseñaban en español.